Environmentalists and capitalists are often stereotyped as philosophical Hatfields and McCoys - adversaries who rarely see eye-to-eye on issues involving the ecosystem and the financial system. But if there's one thing that both groups do seem to agree on, it's this: recycling, the conversion of solid waste into energy or reusable products, has merit. Basically, recycling appeals to environmentalists because it helps preserve resources used today for further use tomorrow. And capitalists like recycling because it reduces their energy costs and, in some cases, offers profitable business opportunities. Indeed, recycling appears to be shaping up as a high-growth business that's a win-win proposition for both environmentalists and capitalists. To put recycling in a larger context: in the throwaway culture of the developed world that glorifies the new, solid waste - especially discarded electronic gear that has been termed "e-waste" - is a big, growing environmental problem. For instance, about 47 million personal computers and 129 million cell phones become obsolete annually. And when all of that hardware becomes obsolete, more than 80% of it ends up in landfills. 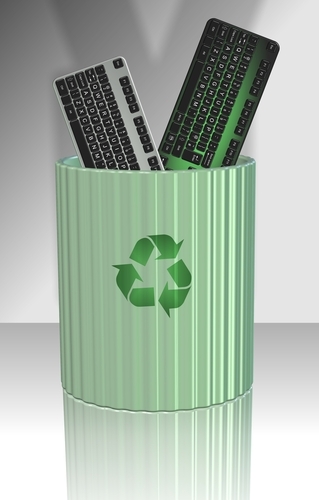 The U.S. now recovers, recycles, or composts about 34% of its solid waste, including e-waste. And with the nation producing an accelerating amount of solid waste annually - currently more than 250 million tons per year, equivalent to about 4.4 pounds per American per day - increased regulation and demand for recycling could help the industry grow at double-digit annual rates over the next 10 years. E-waste collection rates alone are expected to triple by 2020. The industry as a whole now generates more than $230 billion in revenue annually. In a time of persistently high unemployment, more demand for recycling may mean more recycling jobs. Recycling creates five times as many jobs as landfilling. And turning discarded waste into new products draws on the full spectrum of the labor market - from mechanics maintaining collection trucks to chemists and engineers developing new products. In all, solid waste is being perceived increasingly not as throwaway material but as an abundant asset with an economic value that the recycling industry can cultivate and amplify. And in a nation where strident opposition seems to surface on any issue as easily as toadstools in the spring, recycling is a refreshing anomaly: it's helping to bridge the gap between the philosophy and practices of environmentalists and capitalism, benefiting both the environment and the bottom lines of companies.